Over the last year or so, there has been an extended and quite active thread on cyclic twinning on the FMF About cyclic twinning - (5). 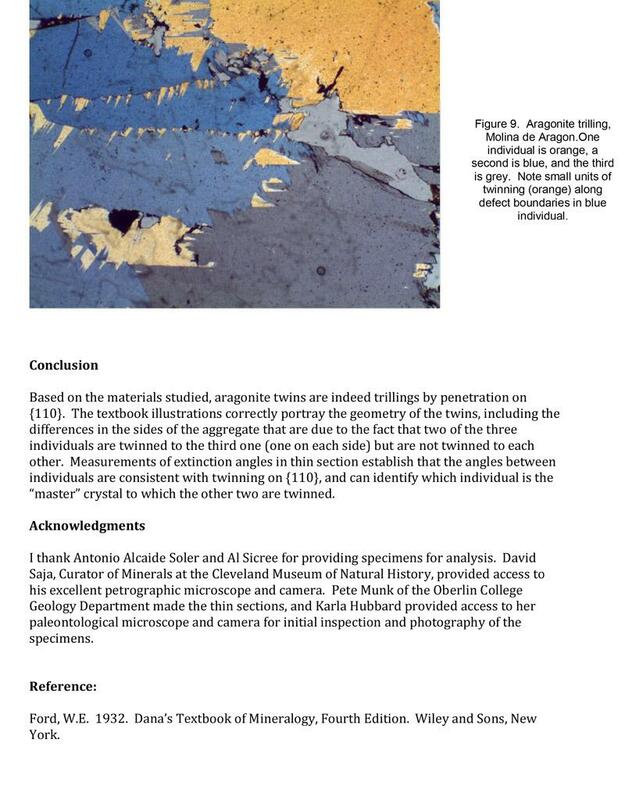 Early on, part of the discussion was about aragonite twinning of the classic pseudo-hexagonal habit form such as occurs at Molina de Aragon and Minglanilla, Spain, as well as many other places. The question was whether these twins were better understood as interpenetration trillings or as cyclic sixlings by rotation about the vertical axis. 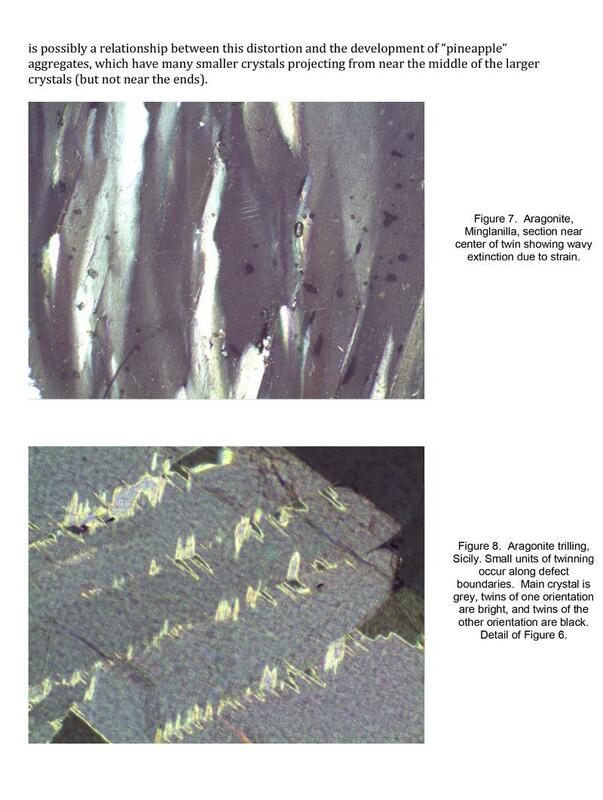 Stimulated by this discussion, I did some original petrographic research using thin slices of these twins, to try to confirm the classic interpretation presented in mineralogy textbooks, or to discover if some other relationship was appropriate. 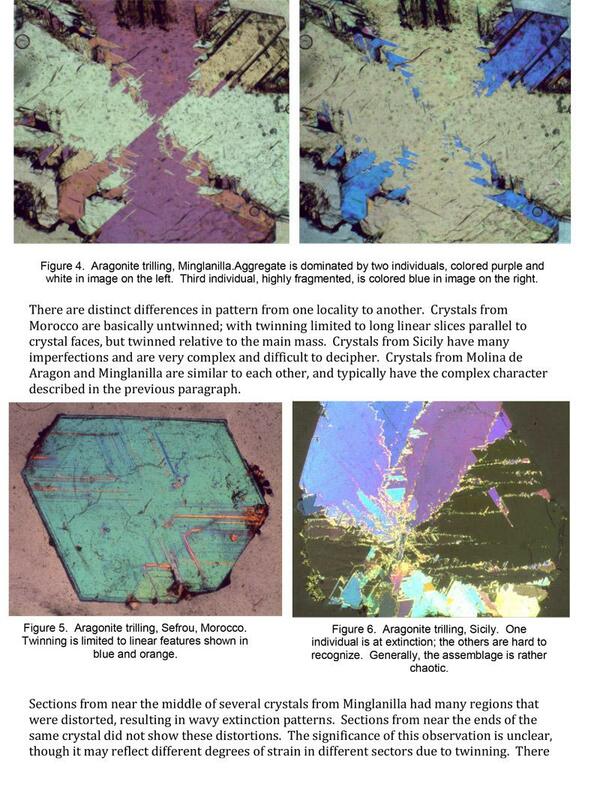 My findings are presented here as a new thread on the twinning of aragonite. 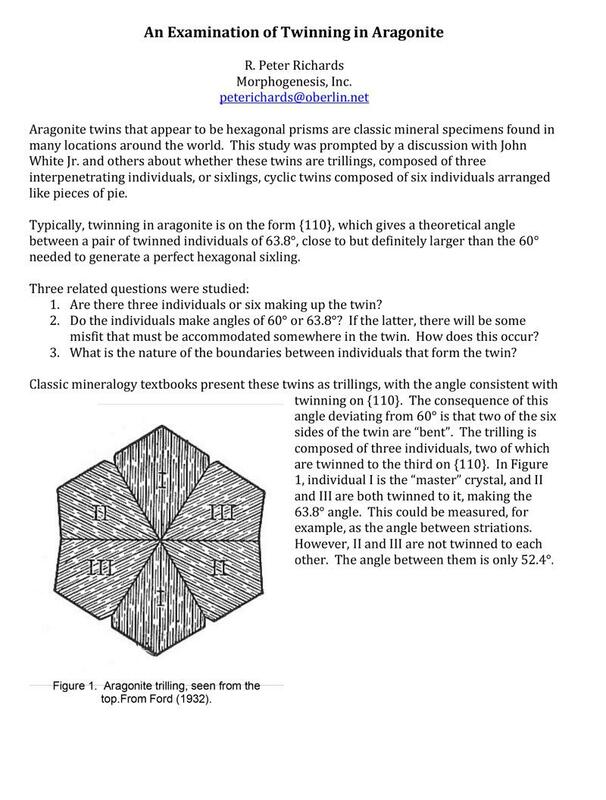 This thread deals specifically with the twins that approximate hexagonal morphology; there are certainly other aragonite twins that don't fit this concept. They might be candidates for a different thread! That is a good question. 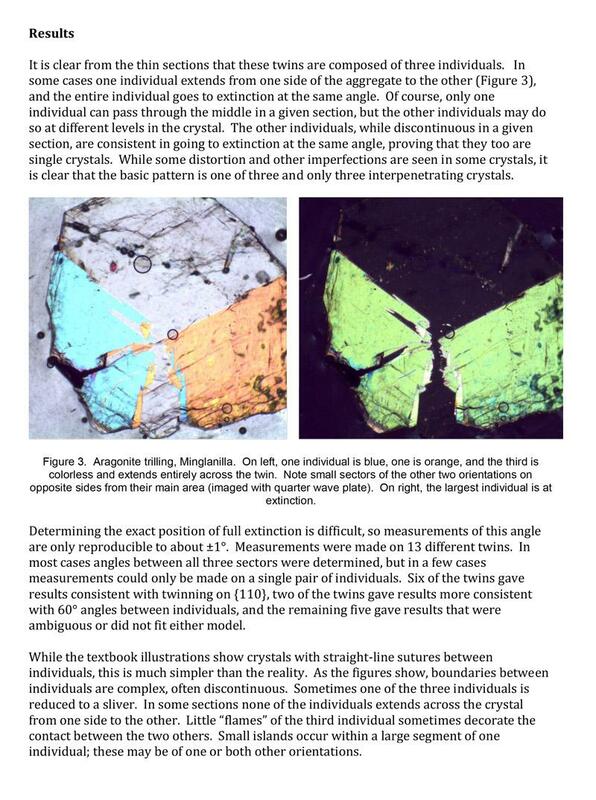 It would be possible for two crystal pieces to have the same orientation in a section but in fact be two completely different crystals, not connected at any place in the twin. 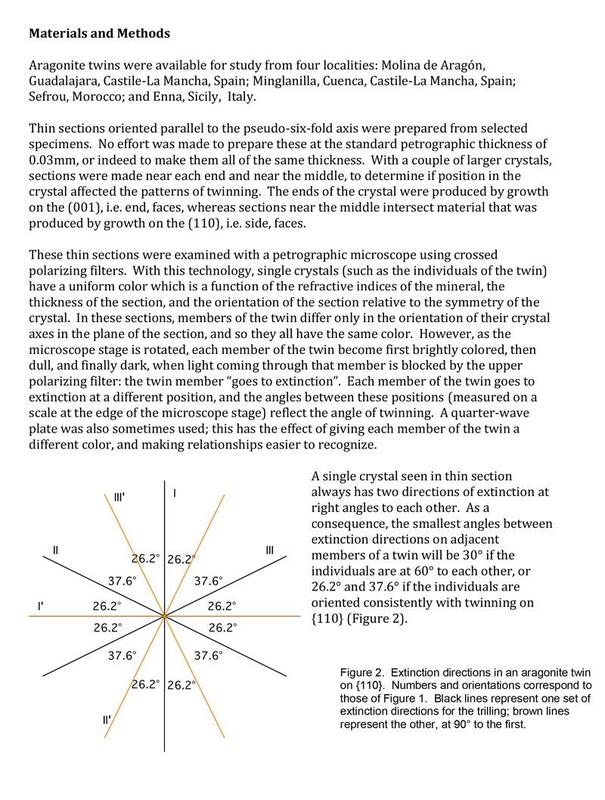 This seems unlikely because twinning usually starts very early in crystal growth, whereas this idea would require that at least one of the twin members formed later. 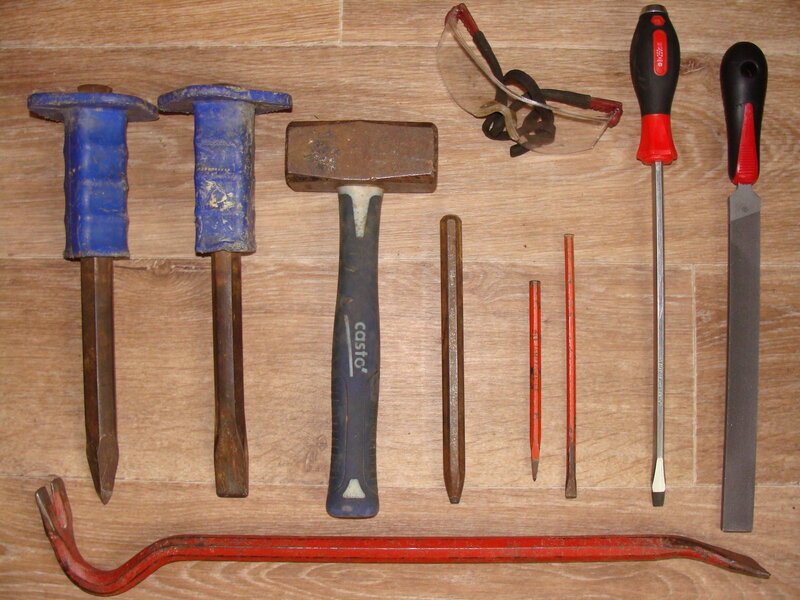 Still, it cannot be ruled out and it would be almost impossible to evaluate using (many hundreds of) thin sections! Thank you very much, Pete, for this thread with your conclusions after the research. 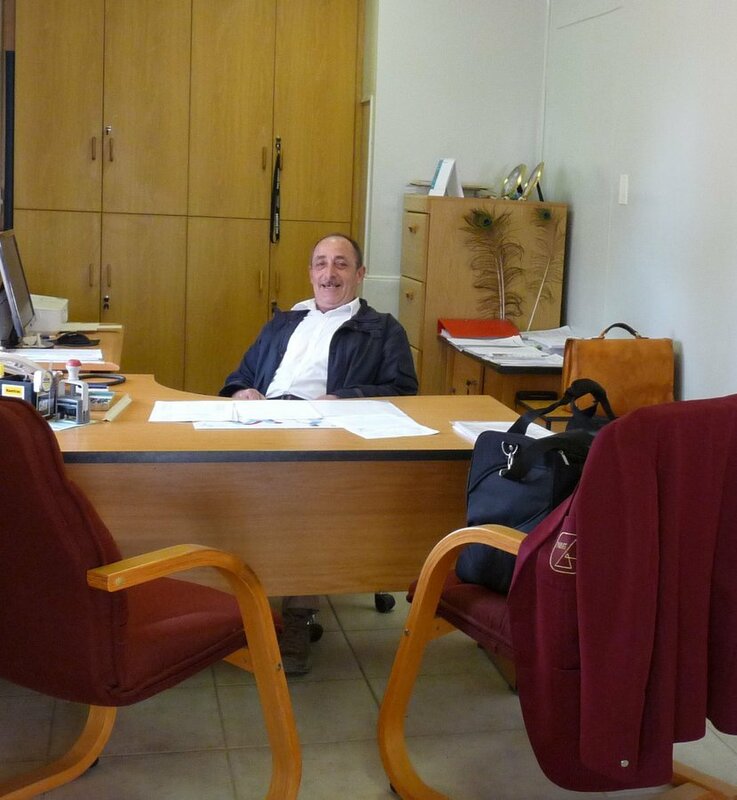 Especially I would like to thank your clear and pedagogical explanations that let many of us, who lack of the adequate background, understand easily. Now I see that textbook drawings are often theoretical representations, far enough from the complex reality. I am surprised by the differences between Spanish and Moroccan aragonites whose external appearance looks like very similar. That discussion is still in progress so I hope not to blunder bringing forward the link. Antonio, I am really pleased to get my little contribution cited here, which contains several references to Pete's researches! Very clear and very interesting. Thank you. Your article helped me understand one of my specimens better. I'm definitely pleased to find the very little side of the bargain cited the following, which in turn has several references to be able to Pete's studies!